In a conventional liability insurance policy, the insurer pays a victim the lesser of (a) the damages assessed in a covered lawsuit and (b) a "per occurrence limit." If it were lawful to do so, you could write a modified liability insurance policy; however, in which the insurer would pay the victim the damages assessed in a covered lawsuit unless those damages exceeded some limit, in which event the insurer would pay the victim nothing and the insured would pay the insurer an additional special premium. 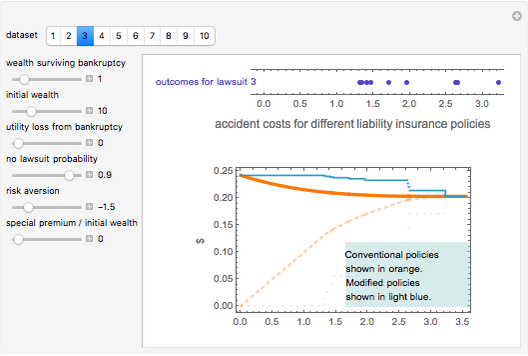 This Demonstration examines premiums in a competitive market and the expected accident costs (premiums + monetized residual risk). The premiums are shown as dashed lines and the expected accident costs are shown as solid lines. As can be seen, the modified insurance policy will frequently be more advantageous to the insured, although it may be an unlawful insurance policy. The user can choose from among 10 different datasets regarding potential lawsuits and can select the wealth that the insured will be left with if it is bankrupted, any additional utility loss from having been bankrupted, the initial wealth of the insured, the probability that no lawsuit will be filed against the insured, the relative risk aversion of the insured, and the amount of any special premium for modified policies. Notwithstanding the suggestion in this Demonstration that, in many settings, the modified liability insurance contract will be superior to the traditional liability insurance contract, many American states have laws that will make such policies difficult to implement. In particular, many states have laws that prohibit the insurer from diminishing the amount it owes to the insured on account of the insured's insolvency; yet it is precisely when the insured would otherwise become insolvent that the insured often wants to have a special premium obligation to its insurer or, at a minimum excuse the insurer from having to pay the victim. This Demonstration thus highlights that these laws, if they make sense at all, are written to protect potential victims and not insureds. Because they result in additional premiums, however, these laws may deter the purchase of liability insurance or diminish the amount of coverage purchased and thus may hurt some potential victims. Seth J. Chandler "Efficient Single Limit Liability Insurance"